Scenes at Jazz Alley – July 12 – only 10 bucks! Make a reservation for this show. The Pacific Jazz Institute at Dimitriou’s Jazz Alley presents ‘2009 Jazz Label of the Year’ Origin Recording Artists “Scenes” celebrating their recent release Along the Way. Band members are John Stowell (guitar), Jeff Johnson (bass) and John Bishop (drums). Set times on Sunday at 7:30pm. Doors will open at 6:00pm. 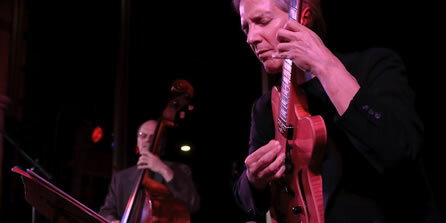 The Northwest trio of guitarist John Stowell, bassist Jeff Johnson, and drummer John Bishop were first heard together on the 2001 release Scenes along with tenor saxophonist Rick Mandyck. Now returning as a trio under the name “Scenes”, they continue their exploration of free flowing yet highly melodic ensemble playing as they perform an all original set of music on their latest release, Along the Way. Drawing on Stowell’s longtime association with bassist David Friesen and Johnson & Bishop’s involvement in the very fertile Seattle creative music scene that has included Julian Priester, Jessica Williams, Gary Peacock, Larry Coryell & so many more, the trio sculpts an elegant, intelligent, uncompromising yet very accessible jazz sound. Marine View Church, 8469 Eastside Dr NE, Tacoma, 5pm, Free. All ages. From Earshot Jazz: the new Marine View Church Jazz Series promises to bring some wonderful music to Tacoma. Held in the sanctuary, which features a terrific Puget Sound view, the Tacoma venue features jazz performances at 5pm the last Sunday of each month. In June, the Susan Pascal quartet strikes a fine balance between spontaneity and imaginative arrangements, original music and the great American songbook. Future months will feature HipBone, Jovino Santos Neto, and Gail Pettis, to name a few, so keep your eyes open. 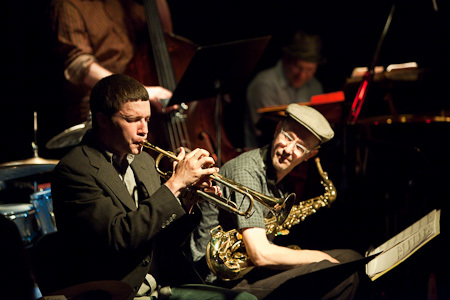 McCullough’s debut recording, Dark Wood, Dark Water (Origin Records, 2009), taken from the title of a poem by American poet Sylvia Plath (1932-1963), is a strong debut, emphasizing the 27-year-old trumpeter’s prowess as an improviser who demonstrates an understanding of the rich lineage of jazz trumpet. 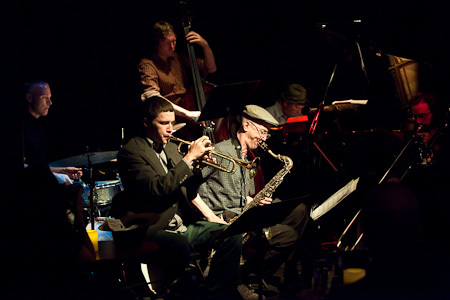 The disc also showcases clearly defined compositions, arranged for sextet and custom-fit to the individual strengths of what McCullough calls his “Dream Team” of musicians: alto saxophonist Mark Taylor, tenor saxophonist Geof Bradfield, pianist Bill Anschell, bassist Jeff Johnson and drummer Bishop. All About Jazz: Each of the nine tracks on Dark Wood, Dark Water has a distinct character. There are no two pieces that sound alike. Chad McCullough: I’ve been working on a lot of those tunes, in some form or another, for awhile. The material for the recording has developed over time. Also, I knew I was going to have Mark, Geof, Bill, Jeff and John on the record and I wanted to write specifically for them so I could highlight them individually and as an ensemble. It wasn’t really a conscious decision of having one tune in 7/4, one with a Latin feel, etc. It was more about wanting to have a tune that Jeff would sound really good on, or one that I could show to John and he would be able to instantly understand where I’m coming from. Seattle’s Origin Records was recognized as the 2009 Jazz Label of the Year at the JazzWeek Awards, held June 20th in Rochester, NY, during the Xerox Rochester International Jazz Festival. The JazzWeek awards are voted on by several hundred members of the jazz industry including radio program directors, disc jockeys, program syndicators, satellite and cable broadcasters, record labels and promoters. JazzWeek’s Ed Trefzger presented the award to Origin’s John Bishop during the JazzWeek Conference which has taken place alongside the Rochester Jazz Festival each year since 2003. Also nominated in the Label category were Concord Records, Palmetto, Sunnyside, Heads Up, and HighNote Records. But for his latest album, “We Couldn’t Agree More,” released last month on Origin Records, Anschell didn’t arrange a single note. Every song is a standard, unrehearsed, with few details discussed in advance, and in many cases recorded in one take. 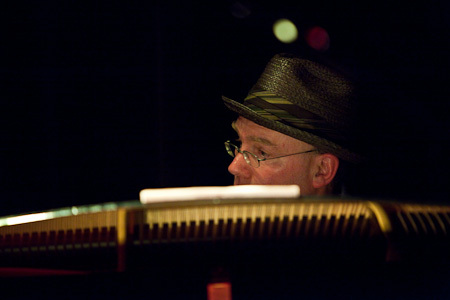 Anschell called the album, recorded with saxophonist Brent Jensen, his most spontaneous and intimate. The two musicians were the only ones present at the recording session in a friend’s living room in Idaho. Anschell even mixed the album himself on his home computer. It is the simplest project he’s ever done and perhaps the most revealing of his musical personality. He plays very little walking bass or stride, a left-handed style typical of a piano when played without a bass and drums. Anschell and Jensen don’t really take turns playing. Instead they constantly respond to each other, picking up on rhythmic riffs and turns of phrases. Sonny Clark Memorial Sextet performing at Egan’s Ballard Jam House. 9pm – Tim Lienhard Quintet, with Tim Lienhard (trombone), John Cheadle (alto sax), Gus Cerns (piano), Luke Bergman (bass) and Zach Para (drums) – CD release!